Arthritis is a common problem of the lumbar spine (the five bones that make up the lower back). 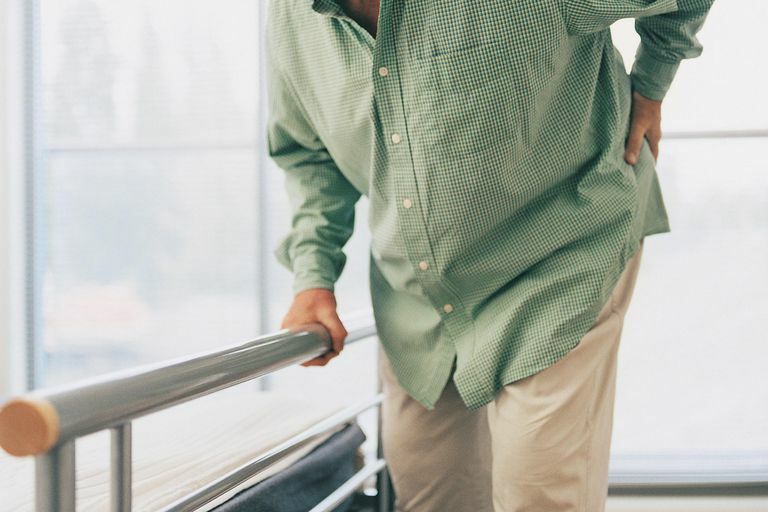 While lumbar spine arthritis is most commonly seen in older people, it can also affect heavy laborers, people who are obese, or anyone who has had a previous spinal injury. Lumbar spine arthritis typically occurs in the joints that connect the spinal segments called vertebrae. Each vertebra is connected in three places. In front of the spinal cord, the vertebrae are separated by a cushion-like spinal disc. Behind the spinal cord, the vertebrae are connected by two small joints called facet joints. The facet joints, together with the spinal disc, allow movements of the spine, including forward bending, sideways twisting, or the arching of the back. The most common type of arthritis affecting the spine is osteoarthritis, also known as wear-and-tear arthritis. The development of osteoarthritis in the spine is specifically referred to as spondylosis. Disc degeneration is a term used to describe the deterioration of the facet joints due to long-term wear and tear. The damage caused by disc degeneration enables the development of osteoarthritis. Spinal stenosis is the narrowing of the spaces within the spine caused by the overgrowth of bone. Osteoarthritis is the primary culprit, the condition of which can pinch nerves and cause radiating nerve pain. When lumbar spinal joints become arthritic, movements in the lower back can become painful and stiff. While efforts can be made to alleviate these symptoms, the condition tends to be progressive and worsen over time. People with lumbar spondylosis will often notice that their lower backs are especially stiff in the morning and gradually loosen throughout the day. Symptoms tend to worsen with prolonged or strenuous activity. Even sitting for long periods of time can cause discomfort. As the disease progresses, triggering ever-increasing bone malformation, bone spurs (osteophytes) can develop and press directly on nerve roots. This can cause lumbar radiculopathy, commonly referred to as sciatica. Sciatica is characterized by a sharp, shooting pain that emanates from around the lower back or buttocks and travels down the leg or inner thigh (depending upon which nerve root is affected). The condition may be chronic or occur with specific movements or types of physical activity. Other symptoms may include muscle weakness, muscle spasms, headaches, and an uncomfortable pins-and-needles sensation (peripheral neuropathy). Lumbar spine arthritis is typically diagnosed based on your symptoms, medical history, and imaging tests. An x-ray may be used to look for bone damage, bone spurs, and the loss of cartilage or a spinal disc. Magnetic resonance imaging (MRI) may be used to diagnose early cartilage damage as it is better able to visualize soft tissue. Blood tests may be used to exclude other causes, including rheumatoid arthritis (an autoimmune form of the disease), fibromyalgia, gout, tendonitis, or septic arthritis (an infection in the spinal joint). The treatment of lumbar spine arthritis is directed by both the symptoms experienced and the characteristics of the joint or bone damage. Most doctors will take a conservative approach when first starting treatment and only explore more invasive options if the pain or impairment becomes severe. Physical therapy is used to strengthen the muscles of the lumbar spine. By supporting the spine with stronger muscles, less burden is placed on the facet joints. Weight loss improves symptoms simply by reducing the stress placed on the lumbar vertebra. While weight loss can be difficult for those already experiencing impairment, low-impact exercises (such as swimming) combined with a reduced calorie diet can often achieve the results needed to alleviate pain. Anti-inflammatory drugs can decrease the swelling and inflammation in and around the vertebral joint. While over-the-counter drugs like Aleve (naproxen) or Advil (ibuprofen) can often provide ample relief, stronger prescription drugs like Voltaren (diclofenac) and Arthrotec (diclofenac/misoprostol) are sometimes needed. Ice and heat application can be also effective in relieving lumbar back pain. Heat can help "loosen" the spine before activity, while ice is best used after activity to reduce inflammation. Chiropractic treatment is popularly explored as a mean to "manipulate" the spine. While the treatments do not alter the spinal alignment as some may suggest, they may provide short-term relief by loosening compressed vertebral segments. Epidural injections involve the administration of a steroid known as cortisone in or around the pinched nerve. Cortisone can temper the immune system, thereby relieving localized inflammation and radicular pain. Spine fusion is a surgical procedure used to eliminate movement between the adjoining vertebrae. When all other treatments fail to provide relief, a spine fusion may be a reasonable option for the treatment of severe facet arthritis. Complementary treatments include acupuncture, massage, magnet therapy, naturopathic remedies, and other direct or indirect forms of back therapy. While the scientific evidence supporting these treatments is largely lacking, most have few side effects and are reasonable options if used in conjunction with standard medical care. Chang, H.; Lynm, C.; and Glass, L. Osteoarthritis of the Lumbar Spine. JAMA.2010;304(1):114. DOI: 10.1001/jama.304.1.114. Goode, A.; Carey, T.; and Jordan, J. Low Back Pain and Lumbar Spine Osteoarthritis: How Are They Related? Curr Rheumatol Rep. 2013;15(2):305. DOI:10.1007/s11926-012-0305-z.